"I don’t think Mozart’s going to help at all." British composer Ralph Vaughn Williams, who greatly influenced young Bernard Herrmann and for whom he had a great admiration, took the subject of film score composition seriously and in encouraging his contemporaries to do the same said, “I believe that the film contains potentialities for the combination of all the arts such as Wagner never dreamed of, and I would therefore urge those distinguished musicians who have entered the world of the cinema to realize their responsibility in helping to take the film out of the realm of hack work and make it a subject of a real composer.” Music constitutes an essential part of the film experience, yet we often fail to acknowledge its importance to the way we perceive film. This is not to say that music is comprehensible only to those who have formal training; to the contrary the ability to appreciate music is a capacity we all share. The often overlooked genius of composing for film in general, and of Bernard Herrmann specifically, is an ability to work within the parameters of music theory while exploiting the viewer's instinctive knowledge of musical conventions, creating a lush musical landscape perfectly suited to the emotional content of the image captured on film. 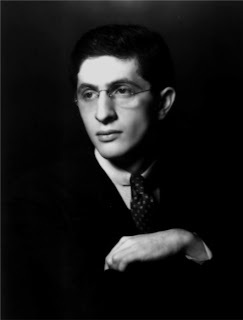 Composer and conductor Bernard Herrmann was born on June 29, 1911 at New York City’s Lying In Hospital, the eldest of three children born to Abraham and Ida Herrmann. Benny, as he was known to his family, suffered a major health crisis at an early age in the form of St. Vitus’s Dance, which he barely survived. He spent much of his time as a boy and a young man reading biographies of artists and composers, learning musical works through his father’s collection of 78rpm recordings and attending live performances of the New York Philharmonic at Carnegie Hall. His literary discoveries through the New York Public Library included the Treatise on Orchestration by Hector Beriloz (he was familiar with the composer’s Symphonie Fantastique and later claimed the book convinced him to become a composer). Herrmann wrote many small-scale works as a teenager, most of which remain unpublished. He studied music at the Juilliard Graduate School, and at the age of twenty he formed the New Chamber Orchestra of New York. Herrmann was no snob about cinema, he was familiar not only with American films and composers but also with their European counterparts, but he was well aware of the obstacles in composing for film. A film composer often completed scores in as little as two or three weeks, rarely had time to do his own orchestration, and once the music was written and conducted had little to say about the sound levels or dynamics of the score in the finished film. Herrmann was confident, however, that working with Welles would be different and it was with no small excitement that he announced his leave of absence to go to Hollywood. His career as a composer for film was demanding and rewarding, in addition to his outstanding scores for Citizen Kane (1941) and The Magnificent Ambersons (1942), he earned his reputation for glorious music on films such as Jane Eyre (1943), Hangover Square (1945) and The Ghost and Mrs. Muir (1947), all of which were about to bring him to the attention of another Hollywood genius, Alfred Hitchcock. The sometimes variable nature of film composition often left the composer without work and Herrmann wrote the score, the first of two "television operas," for a 1954 television adaption of Dickens's classic holiday story. His original compositions for television also included The Twilight Zone from 1959 through 1964, for which he composed the original theme as well as scores for seven episodes (at least three of which were included as part of the Syfy Channel's New Year's Day marathon). His work for The Alfred Hitchcock Hour from 1963 through 1965 included original compositions for seventeen episodes. Much has been written regarding the turbulent end to the collaboration between Bernard Herrmann and Alfred Hitchcock, both from the composer’s and the director’s perspective. Herrmann and Hitchcock were, for most of their eleven years of collaboration, friends as well as associates and Steven C. Smith, author of A Heart At Fire’s Center, observes, “The rapport between the two was strong from the start.” The Hitchcocks often played host to the Herrmanns; Benny and Lucy were invited to spend the weekend at Hitchcock’s secluded Bel Air home, where days were spent in leisurely conversation and evenings spent enjoying Alma’s superb cooking. Jack Sullivan, author of Hitchcock’s Music, suggests the director’s relationships with his composers were often passionate, and as often troubled, in part because the director was "intoxicated by and knowledgeable about music.” Hitchcock's music and sound notes for Vertigo were more specific than on past projects, but what finally emerged as Herrmann’s film score is very different from what Hitchcock had planned. The film’s original title, From Among The Dead, was a reference to the French novel on which the story is based, and Herrmann’s composition was to be supplemented by passages from a lost score that had haunted the director for decades. Hitchcock had seen Mary Rose, a dramatic tale of lost love regained written by J. M. Barrie, during the play’s London run in 1920 and became enthralled by the music of Norman O'Neill. The Musical Times and Singing Class Circular, Volume 62 dated March 1, 1921, described the composer and his work for Mary Rose as follows: “A dreamer of dreams and a mystic, Norman O’Neill has the power of expressing in his music the ethereal world in which he dwells. His flights of fancy, intangible though they are, touch a responsive chord in the hearts of the imaginative. . . .The ‘Mary Rose’ call continued to haunt the ear with gentle insistence long after it had reached echo-land.” Hitchcock was especially struck by 'the Call' connected with the heroine's disappearance, he later remembered the sensation as "celestial voices, like Debussy's Sirenes nocturne." Hitchcock twice failed to uncover the music, which he had also intended to use as part of the Rebecca film score, and as usual he deferred to Herrmann with memos and notes reflecting his confidence in the composer, "Mr. Herrmann may have something to say here" and "All of this will naturally depend upon what music Mr. Herrmann puts over this sequence." Esa-Pekka Salonen and the Los Angeles Philharmonic, Debussy's "Sirenes nocturne"
If there is truth in the notion that music is the language of the inexpressible; Bernard Herrmann’s film score for Vertigo has given a voice to an ordinary man who finds himself in extraordinary circumstances. Herrmann’s main title sequence intentionally avoids an identifiable melody, exploits unpredictable rhythmic changes and flirts with tonal ambiguity. Kathryn Kalinak, author of Settling The Score observed, "The combination of violins and tubas played in alternately ascending and descending arpeggiated chords (played in succession rather than simultaneously)" and moving in contrary motion creates an asymmetry (if you will) of sound keeping the viewer continually off guard musically. 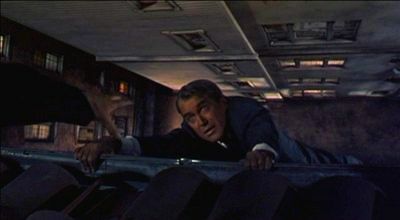 Herrmann's main title music is heard first, but the musical effect in combination with Saul Bass's visual imagery in the opening credits reinforces the feeling of vertigo. The visual acts as counterpoint to the music; the spiraling images create a visual vortex in the same manner the music creates a spatial vortex and the viewer enters the world of the film suspended between two possibilities. Film criticism often invites the amateur “to see into” the life of a film, which results in as many interpretations of dramatic themes and visual cues as there are viewers. Film music makes a distinction between the life experienced by the characters and the life viewed by the audience. The classical film score can often combine nondiegetic music, music heard by the audience but not experienced by the characters, and diegetic music, music heard as part of the world in which the characters move and live. 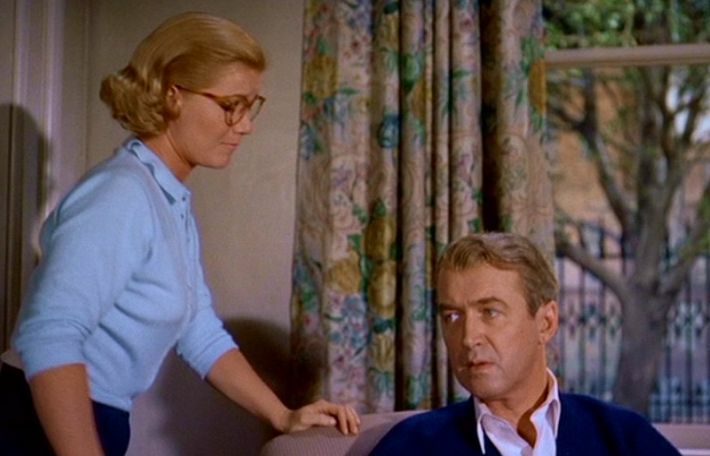 The two instances in which diegetic or “live” music occur in Vertigo are scenes of emotional significance for Midge and Scottie. The first occurs after a bit of magical thinking on the part of Hitchcock, when Scottie is inexplicably delivered from hanging precariously between life and death. The scene opens on a cozy domestic setting, the man and woman could be husband and wife, could be brother and sister. We learn about both through their comfortable exchanges and through the use of music. John-O, as she calls him, and Midge share a past but appear uncomfortable in their present relationship. Her choice of music, an Overture by J. C. Bach, and her taste in contemporary furniture slyly hint that she is comfortable making brief visits to the past while living very much in the present. He is uncomfortable sitting in her Eames style chair and tells her the music is the cause of his vertigo (all important cues in the events that will soon engulf Scottie). The second, and perhaps more significant, occurs in the use of Mozart’s 34th Symphony as “a rope from heaven” to draw Scottie from his abyss of acute melancholia with guilt complex. Musical therapy was first used after World War I in an attempt to reach veterans suffering from profound mental trauma, and Scottie's musical therapist has told Midge that Mozart is the boy for him (Author and physician Oliver Sacks relates in Musicophilia: Tales of Music and the Brain not only is music haunting, irresistible and unforgettable, but "music occupies more areas of our brain than language does and humans are essentially a musical species"). Scottie responds to Midge, following her with his eyes and turning his head in her direction, but we can't help but agree with Midge that Mozart isn't going to help at all. James Stewart’s Scottie is half enthralled to possibility, but remains half captive to reality. A man no longer content with his passivity in the face of life’s acting on him; he is trapped in a sort of tenacious, immaterial fantasy rendering him incapable of action. In his ability to capture the ineffable quality of this character’s waking nightmare, Herrmann essentially created a film score that can be heard on two levels simultaneously. His use of leitmotifs reminiscent of both Wagner’s Tristan and Isolde and Berlioz’s Symphonie Fantastique, share thematic similarities but are by no means derivative. Herrmann is here demonstrating his comprehension that some members of his audience will recognize the reference to these musical passages, while all will understand the emotional content of his music (an equivalent can be found in the screenwriter who includes lines of poetry by John Keats which reference the Romantic era against which the film is set. Those familiar with Keats’s life will understand the specific reference; those unfamiliar with Keats’s life will hear the beauty of the poet’s words). 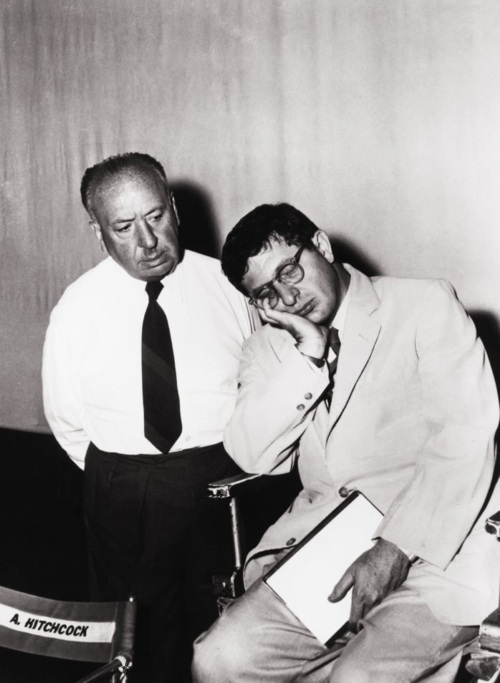 Bernard Herrmann has been called "Hitchcock's Maestro," and while he might have been uniquely suited to capture the spirit of the dark and troubling tales the director brought to the screen, his work before the famed collaboration would establish his reputation. His affinity for the Romantic era, equally the composers as the poets, his "pastoral poetic gloom" and artful mourning of that which is irrevocably lost can all be heard in the hauntingly similar Portrait of Jennie (1948) for which he composed the theme song but was not credited. An observation regarding Vertigo highlights the intrinsic nature of Herrmann's score in the film's storytelling: close your eyes and listen to any passage and be immediately transported to locations and scenes in the film. The true power of Herrmann's score is in the music's ability to be heard independently from Hitchcock's images (the dream fades, the music lingers). Esa-Pekka Salonen, conductor of the Los Angeles Philharmonic Orchestra, recognized the art of Bernard Herrmann's film music, performing and recording many of Herrmann's compositions. Scene D’Amour is the moving heart of a poignant film portrayal of a man suspended between action and despair, death and life, love and obsession, themes worthy of any Romantic era composer. Betrays me back, till the heart of me weeps to belong. ~ excerpt from Piano by D. H. Lawrence. Whistlingypsy/aka/Karin of Distant Voices and Flickering Shadows is a technical writer working on a contract/freelance basis who lives in the beautiful Hill Country of Texas. 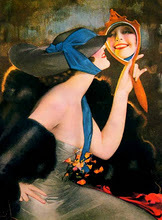 She was inspired by The Lady Eve (the blogger not the movie) to begin a blog and share her fascination for Jazz Age music and Silent Era films. She considers herself an enthusiastic amateur with an interest in films, music and writing. Thanks for the musical insight on Vertigo and Herrmann. He has long been a favorite of mine, but Eve can tell you that I have many favorites! It is almost a shame that in a movie so visually stunning as vertigo, this beautiful music is almost lost. Movie music is sometimes supposed to be subliminal. I try not to let that happen. I purchased the soundtrack to Last of the Mohicans (1992). I thought the music was period correct and added a lot to the visuals. When I played the CD without the movie, I was disappointed in how dark it sounded, because it was mostly written in minor chords. Herrmann's music sounds great, with or without the movie. Excellent post. A few things you might want to know. The film was shot in Vista Vision with did not support a true stereo soundtrack. It could use any of three different formats : Optical mono on standard 4-perf reduction or 8-perf contact print.A Perspecta sound fake stereo optical track cold be used on either type of print. Peespecta sound was plain mono (think early Dolby Pro Logic)it could only operate with sound effects when no music or dialog was present, because all the sound moved all at once. So the Vertigo score was in mono . Wow. Whistlingypsy, this is an incredible article. You have brought so much to the table! I've learned so much about film music and Herrmann from this reading alone. I particularly love your introductory paragraph. "...the ability to appreciate music is a capacity we all share." You have brought history and analysis to life and with such enthusiasm and pride! Your observation on his Vertigo composition is very thorough. The music does have that "spiral" effect, we are being drawn closer and closer into the vortex. ITs interesting that Hitchcock had his own idea for the music but had so much faith in Herrmann to take it another direction. I loved every bit of this blog essay, and I am not just saying that because I'm your friend. :) You have really outdone yourself with this wonderful article. I'm definitely going to have my mom read it. lol. She loves film music (although her favorite at the moment is Morricone's Cinema Paradiso, she needs to get well acquainted with Herrmann). Gypsy, a very impressive post on what seems to me a daunting subject. That music is so inherently non-verbal makes it extraordinarily difficult to write on. It's clear how much research and effort went into creating your post. 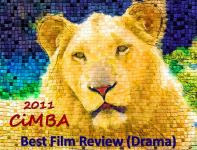 I liked the way you described the connection between film music and the emotions of the film, describing the film score as, ideally, a "musical landscape perfectly suited to the emotional content of the image." I think what makes Herrmann such a great movie composer is the way he was able to get to the essence of the emotional tone of a scene. Film music is too often used to cue the viewer's response to scenes that don't adequately do this on their own. Maybe it's because he tended to work with such talented directors, but Herrmann's music never seems to me to add things that aren't already there, but to find them and amplify them. I also liked the way you wrote that the music in "Vertigo" is effective on its own, even if you don't get the musical allusions. Also appreciated the biographical background on Herrmann, which was mostly new to me. Karin, you had a rather difficult assignment in this month-long endeavor, but you do a nice job of explaining Hermann's importance in the overall production. I prefer that dramatic and atmospheric styles be used together (ala Clint Mansell), but I enjoy Hermann's Vertigo score very much as well. Enjoyed reading this article. Fascinating post Karin on one of the most important pieces of the filmmaking process. Music adds so much to the atmosphere, the mood, call it what you will. It just adds another layer and depth that would be missing without it. Herrmann's music is an integral part of each and every film he worked on. Thanks for such a great piece, your combination of background, history and analysis is stunning. Fascinating post WhistlingGypsy. We often take for granted the contributions of all the arts and crafts that go into making a film. In such a masterful work as Vertigo, even with the composition and conducting of a Hitchcock, it is really a collaboration of artists in the telling of a story. It is especially in those wordless moments of the story that the music concentrates the emotional impact of what's taking place on the screen. Herrmann was a master of this art. Thank you for giving us another reason to admire Vertigo. fascinating and brilliant job...plus a Wallace Stevens reference...I M impressed!!!!! I loved how the music created the mood in the scenes that gave you a sense of unease.. and kept you sitting on the edge of your seat..
A Wonderful write up and I will be spotlighting the Vertigo series on "This week on N and CF" post for the rest of the month. 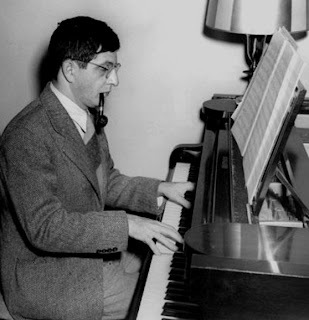 While the so-called legitimate composers of the era were focusing on "atonalism" and "serialism" and other such 20th century musical innovations that seemed to invoke more an intellectual response than emotional, composers like Bernard Herrmann and Erich Corngold ("Adventures of Robin Hood") were able to find within film the expression for a grander, more sweeping music that grew out of the Romantic tradition of the late 19th and early 20th century. This was a music that communicated deeply on the psychological and emotional level and referenced earlier great artists such as Mahler and Wagner. This style of music was considered out of vogue among the contemporary critics but I've always felt that through the brilliance of Bernard Herrmann, and others, it was the perfect musical compliment to the classic love stories, thrillers and historical dramas that were being produced during Hollywood's golden era of films. Music is the stuff that dreams are made of, and with "Vertigo", which has such a powerful emotional undertow, Bernard Herrmann composed the perfect musical accompaniment, or perhaps one should say, musical participant. 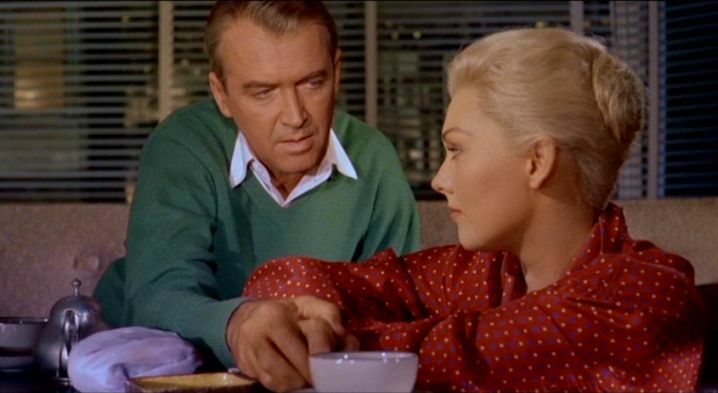 The psychological, almost mystical vortex of "Vertigo" was created by a marriage of image and sound that pulls the viewer in and casts a mood that is almost a form of trance or spell. Thank you for putting such a clear light on Bernard Herrmann and his contribution - he's definitely one of the greatest composer's in the history of film. 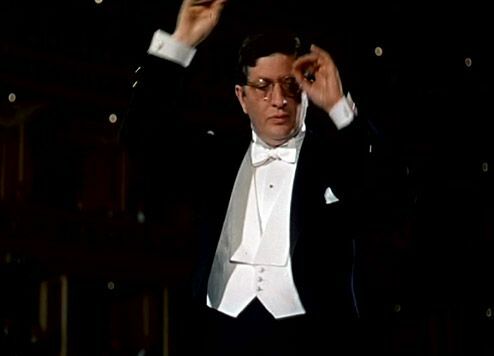 Just how great is Bernard Herrmann? In mt rankings he's the best film composer of all-time, ahead of such distinguished artists as Max Steiner, Ennio Morricone, Erich Wolfgang Korngold, Miklos Rosza, Alfred Newman, Nino Rota, Franz Waxman, Toru Talemitsu, Victor Young and others. It could well be argued he was the most versatile of them all doing all types of music from the days of CITIZEN KANE and the 1944 JANE EYRE to the Harryhausen fantasy films on to the brilliant and brooding work for Hitchcock. My personal favorite of his scores is the achingly beautiful lyric composition he penned for Nick Ray's 1952 film noir ON DANGEROUS GROUND, a score I rate with Rosza's BEN-HUR as the greatest ever written. There's little question that his extraordinary work on VERTIGO, which you spectacularly consider here in this amazing feature is considered by many to be his best work. Those of us who visit the theatres of again reminded of the allure of this score, the end section of which was used in the charming new movie THE ARTIST. It's sad to recollect that Herrmann and Hitchcock had an ugly falling out afterwards that was never healed before the composer's untimely death after he capped his incomparable career with that jazzy masterpiece for Scorsese's TAXI DRIVER. Just two months ago I was graced to attend many films (all of which like so many others here I have seen in the past multiple times) in the Bernard Herrmann Film Festival at the Film Forum in Manhattan. This profect only re-confirmed what I long have known: Bernard Herrmann is film's most justly celebrated film composer. Again, I applaud your expert and passionate piece of writing here. 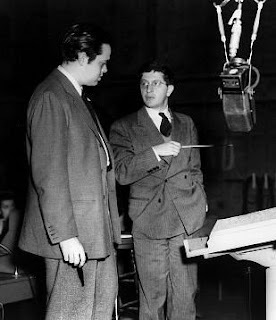 Whistling Gypsy (or Karin, if you prefer), I'm truly bowled over by your brilliant, lovingly detailed blog post about the musical partnership between Alfred Hitchcock and one of my favorite composers, Bernard Herrmann. It's strange how music can be so tangible and compelling, and yet so hard to put into words why it moves us, but you did a great job of it. I was especially pleased that you included the clip from HANGOVER SQUARE, one of my favorites. I love books and movies equally, and when I'm writing fiction, the right music really helps me get into the characters' heads. I agree that "what makes Herrmann such a great movie composer is the way he was able to get to the essence of the emotional tone of a scene. It's a shame that Hitchcock and Herrmann eventually had a falling-out, but thank goodness we have their amazing musical and cinematic genius to remember them by and inspire others. Superb post! Paul 2, thanks for pointing out Herrmann's stereo recordings. His genius was so fine-tuned because hearing all those instruments from different speakers intensifies my sense of disorientation and even makes me question whether certain sounds are coming from my imagination, while the flat mono version merely positions me as a receptive audience member. Whistlingypsy, you expressed so much so beautifully, particularly this: "A man no longer content with his passivity in the face of life’s acting on him; he is trapped in a sort of tenacious, immaterial fantasy rendering him incapable of action." That and Herrmann's soundtrack remind me that vacillation and vertigo can be such similar states. Gypsy - Your posts have always struck me as lyrical (and sometimes ethereal) journeys that overflow with fascinating insights and information (one of the reasons I'm such a fan of your blog). Your reflection on Bernard Herrmann is no exception - and is one of your finest pieces. As deep as it is wide-ranging, you leave the reader with much to consider. Your reference to Oliver Sacks and his observation that ""human beings are essentially a musical species" is inspired. It seems to me that Bernard Herrmann's potent and innovative, emotionally resonant compositions have the power to reach directly into and touch our inherently musical hearts. I want to thank each of you for your encouraging and insightful comments; it is so nice to hear from good friend and names new to me. I am fascinated by the many and varied perspectives that any film inspires, but music being such a personal element; I am especially pleased by your intriguing responses. I especially want to thank The Lady Eve for her gracious invitation to participate in “A Month Of Vertigo,” and I look forward to reading the excellent contributions of those participants who will follow. I apologize that I left it too late to leave a personal response to each of you, but I hope to change that this evening. Gypsy - a beautiful article. The haunting and provocative score is perfection. It is used in a pivotal scene in "The Artist" and, although I was jarred by its use at first, it seems the perfect music for a scene about letting go of an obsession with something that is an illusion. Marsha ~ thank you for your comments and kind words. I still have not seen "The Artist," but the addition of Herrmann's music certainly inspired a range of emotions and responses. Kay ~ thank you for your kind words; it is lovely to hear from you. I recently noticed your name has been added to those following my blog. I have been meaning to stop by, but I've taken on a second blog this month. I just saw "The Artist" last night and sure enough, there it was. FlickChick is right, too...it's a bit jarring at first, but I like her take on why it may have been selected. A film buff pal of mine said that he read Kim Novak was steamed that it was used...I wonder why? And you know, I'm not sure I would have recognized the musical reference had I not so recently watched VERTIGO...and that's thanks to this lovely crew!